De-thatching (also known as “power raking”) is the process of mechanically removing excess thatch and/or moss from the base of your lawn. 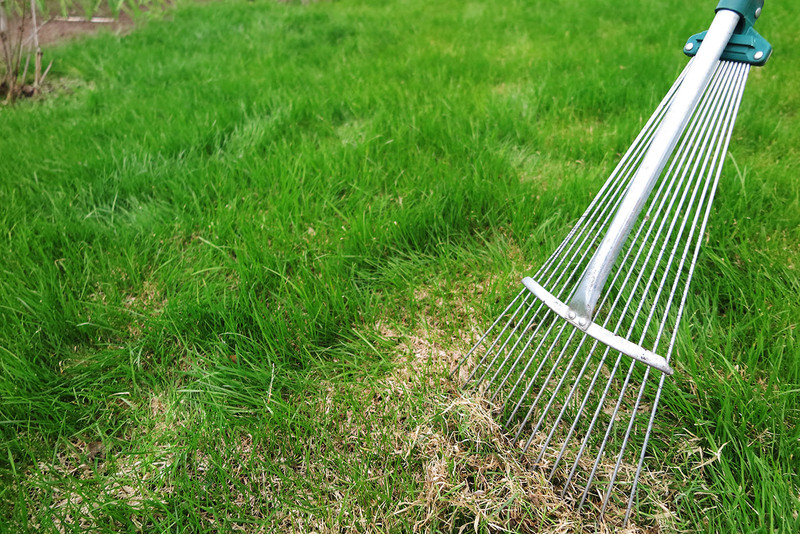 It is a highly recommended lawn maintenance practice for its numerous direct and indirect benefits both to your lawn’s health but also the health of the ecology and your household budget! After setting the de-thatching machine’s blades to the appropriate setting to pull up only thatch and not the grass from its roots, our technicians will perform the de-thatching service in 2 main steps. Step 1 – Pull Up the Thatch/Moss: The self-propelled motorized de-thatching machine is guided over the entire surface of the lawn. As our technician moves along, they leave behind fluffy trails of thatch and/or moss. Step 2 – Rake & Bag: Once the entire lawn has been de-thatched, we will use a large fan rake to rake up the thatch into environmentally-friendly yard waste bags. Please Note: Canadian Property Stars does not haul away the yard waste bags, so we recommend that they be placed in the garage or under some sort of shelter so that they are not soaked in the rain while waiting for garbage pick-up day. The bags should not be left on the lawn. To learn more about de-thatching / power raking and for answers to Frequently Asked Questions, click here.